Three units of science are required for graduation. The sequence of science classes for the Smart Core curriculum path include Physical Science, Biology, and Chemistry or Physics. The Core curriculum path allows Environmental Science to replace Chemistry/Physics. The Core curriculum path requires a Smart Core waiver form signed by a parent. Additional science courses are strongly encouraged for students in the course of study including Agriculture, Food and Natural Resources career cluster, Science, Technology, Engineering and Mathematics career cluster and Health Services career cluster. These additional science courses help meet the six electives required for graduation. For more detailed information on courses offered at RHS, please check the 2017-18 Academic Handbook in the documents section of this webpage. The information on Science can be found on pages 31-35. 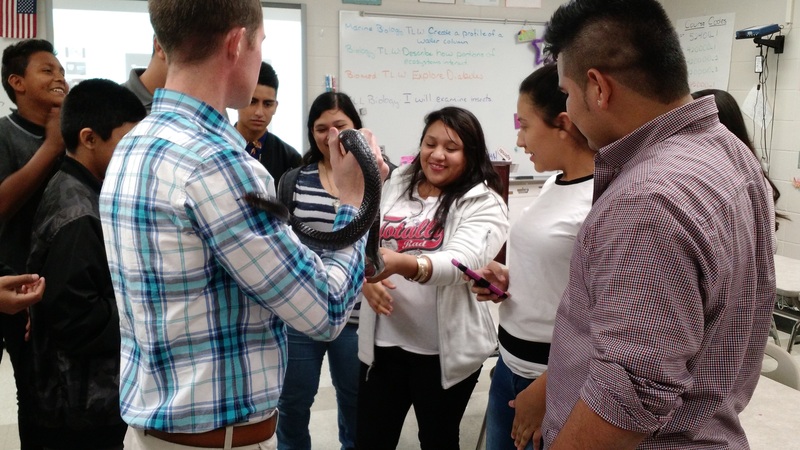 Study of snakes in Biology.